Zzzquil Reviews and Results - Does Zzzquil Work? Occasional difficulty getting to sleep or staying asleep is an issue that nearly everyone experiences at some point. Very frequently, these temporary bouts of insomnia accompany colds. Vicks, the makers of ZzzQuil, knows that many people associate their popular cold medicine of a similar name, NyQuil, with helping them sleep when they have cold and flu symptoms. NyQuil is such a well-recognized household staple, that sometimes consumers might be tempted to buy cold medicine to help with insomnia that isn't related to seasonal sickness. Taking advantage of this ubiquitous brand recognition, Vicks created ZzzQuil as a way to sell yet another product to their customers. 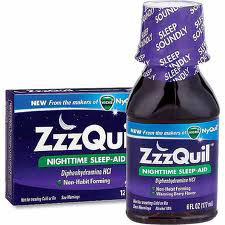 What’s more, ZzzQuil doesn’t actually contain any of the same ingredients that NyQuil is known for. The main and only active sleep ingredient in ZzzQuil is known as diphenhydramine. This is also the main ingredient in popular allergy medications like Benadryl, almost every other over-the-counter sleep medication, and even nighttime pain relievers designed to help you sleep while eliminating minor aches. For many years, the medical community has recognized diphenhydramine's anti-anxiolytic and sleep-inducing effects in addition to its ability to block histamines and help clear congested sinuses, but it’s not without its side effects. Before we get to that, we should also point out that ZzzQuil also contains ingredients like Alcohol, Citric Acid, High Fructose Corn Syrup, and Coloring Agents for the purposes of absorption, color and flavor. While these ingredients are generally deemed safe and included on the "inactive" ingredients list, there are some states where the sales of cold medicines containing alcohol are strictly regulated for good reason. The inclusion of high fructose corn syrup is also questionable as many may not want to ingest this controversial sweetener, known for inducing hyperactivity and weight gain. This is the same sugar found in almost all commercial sodas and the ingredient that is heavily responsible for their bad reputation. Diphenhydramine, as stated above, comes with some glaring side effects. People who take diphenhydramine may experience dry mouth, extreme drowsiness when waking up, and eventually develop a tolerance for it. This may force some people to take more than the recommended dosage to get the same effect. Currently, there are some long-term studies which suggest that prolonged ingestion of diphenhydramine is bad for you. It could lead to nerve damage and even make certain people more vulnerable to brain-aging diseases such as Alzheimer's. There is still some more research to be done before these claims can be said with complete and utter certainty, but we wouldn’t consider it worth the risk if you are having any more than infrequent, occasional insomnia. Like most over-the-counter sleep aids, ZzzQuil is available for sale at local drug stores and some grocery stores. It comes in either liquid-filled gel capsules or in straight liquid form in a bottle so that it can be absorbed by the body a little more quickly. When it comes to the price, ZzzQuil has a much higher cost when compared to other products whose main ingredients is the same diphenhydramine. Many people who are familiar with the sleep-inducing effects of cold medicine would assert that ZzzQuil will likely be able to help you with occasional insomnia. However, it does so by using chemicals, such as diphenhydramine and alcohol and a controversial sugar syrup, which are considered to be unhealthy with long-term exposure. ZzzQuil may work as a short-term solution to occasional insomnia, but taking it for chronic insomnia could be bad for your health over the long run. That's why safe, natural sleep aids, such as those highly-rated on our top sleep aids reviews page, are recommended more highly for people whose stressful lives challenge their ability to get a good night's sleep.